Jacobean Manor House set in parkland with lake and ancient trees. 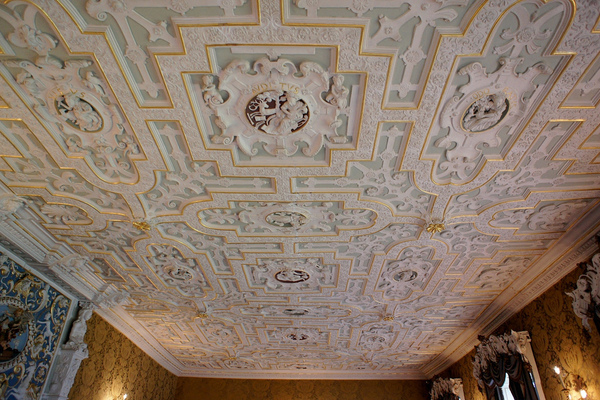 Richly decorated 17C plaster ceilings in State Rooms. The entrance hall was remodelled in the early 19th century. The stone screen probably dates from this period. The plaster ceiling, until recently, was thought to be 19th century; however, it is now believed to date from 1623, despite being in a somewhat older style than the State Drawing Room ceiling of the same period. On your left, on entering the building is the Dining Room, which has a marble fireplace with a painted surround showing entwined Clitherow initials. The room has been restored and is painted Naples Yellow, pre-restoration paint analysis revealed it had been painted in the early 19th century when this colour was very much in vogue. In 1834 King William IV and Queen Adelaide, friends of the Clitherows, came to dine here, a rare instance of a reigning monarch dining at the house of a commoner – for although the Clitherows were wealthy gentry they did not hold any titles of nobility. Extensive work was done to the external facade of the library. The ceiling decoration is Puginesque, a gothic form of decoration inspired by Augustus Pugin (1815-1852). 'Loyal yet Free' incorporated into the design was the motto of the Clitherow family. The main staircase is of oak and is part of the original Jacobean house. The lions on the newel posts were added in the 19th century. The balustrade is reflected in the painted trompe l’oeil on the other side of the stairs, and was uncovered during restoration, as was the 18th century wallpaper to be seen from the half landing between the first and second floors. The magnificent plaster ceiling is an intricate geometrical design divided by moulded bands decorated with a floral pattern. It has been remarked that the design resembles those of 17th century parterre gardens. The panels depict the Five Senses (Sight, Taste, Touch, Hearing and Smell), the four elements (Earth, Air, Fire and Water), the three Virtues (Faith, Hope and Charity, Peace and Plenty, and War and Peace). Some of these inscriptions are in Latin, others in English. Of these figures all are female, except for War, possibly a reflection that the ceiling was commissioned by a woman, Lady Mary Reade, in 1623. There are also some smaller figures representing Time (as a winged cherub and as Old Father Time) at one end of the room. In all there are 37 panels in this ceiling including a number containing emblematic devices and animals and birds. We do not know which craftsman was responsible for the ceiling but stylistic similarities have been noted with ceilings at Bury Hall in Edmonton and the Priory in Tottenham. The plaster overmantle above the fireplace contains a central medallion showing Abraham about to sacrifice his son Isaac but being stopped by an angel. The inscription 'In the Mount of the Lord it shal be seene', a quotation from the Genesis account of the Biblical story, has been ingeniously shortened to fit the panel. The ceiling here is also elaborately decorated but includes only one figure, that of Spes (Latin for Hope). Above the fireplace is a portrait by Sir Godfrey Kneller of Christopher Clitherow; nearby is a portrait of his great-grandson, James Clitherow, at the age of 18, painted by George Romney. There is also a copy of a portrait (now in the Frick Collection in New York) by Gainsborough of Mrs. Peter William Baker – formally Jane Clitherow, sister of the James Clitherow in the Romney portrait. Off this room is a small ante-room which has a plain ceiling. Boston Manor House is a Grade l Listed building dating from 1623. Although an earlier house existed at Boston Manor nothing is known about its architecture. In 1623 Lady Mary Reade, a young widow (born Mary Goldsmith in Suffolk), had the house built, and her initials and this date can be seen in the corners of the elaborate plaster ceiling in the State Drawing Room on the first floor. It is not known who the architect was. Much of the subsequent architectural history of the house is conjectural, but we know that it was substantially enlarged in 1670, when James Clitherow, a City merchant (younger son of a former Lord Mayor of London) purchased the house for £5,136. The Clitherow family remained the occupants for more than two and a half centuries until the house was sold to the local council in 1924 for £23,000. Around the same date the contents of the house were dispersed at auction. The House was renovated in the early 1960s, with further restoration to the ground floor in the late 1990s funded by the Brentford Single Regeneration Bid and Section 106 monies. The house is a three-storied mansion of red brick and stone with straight-sided gables. Four old rain water heads can be seen, three dated 1622 and one 1670. The entrance porch was added in the early 19th century. The architraves to the windows on the ground and first floors, and the bold entablature between the first and second floors (interrupted at the rear by a staircase window) date from the period of James Clitherow’s alterations following his purchase of the house in 1670. Looking at the front of the house (from the Boston Manor Road side), it is thought that the right hand part (under the third gable from the left) is an addition of c. 1670. The service wing to the right is of a later period. The park landscape contains some ancient cedar trees and a lake. Contemporary art exhibition in Boston Manor House: Out There, Out Where, Outside. The title of the show is inspired by a poem by Samuel Beckett. The artist-curated exhibition will present work including painting, sculpture and photography that moves beyond the literal to express the unsaid and the unseen. The concept of the show both juxtaposes and integrates the history and Jacobean architecture of Boston Manor House (1623), whose spare interior invites visitors to imagine its rich past. Participating artists are Matthew Burrows, Sarah Dwyer, Ailbhe Ni Bhriain, Ana Catarina Pereira, Robert Rush and Constance Slaughter.